Sunsailor, Weve made sure your sailing holiday is in safe hands. With a great selection of affordable flights to some of our most popular destinations including Agana and Lefkas, don't hesitate to book now. Call our expert Holiday Planners today on 033 0332 1173 for the best competitive rates on our flight-inclusive holidays. 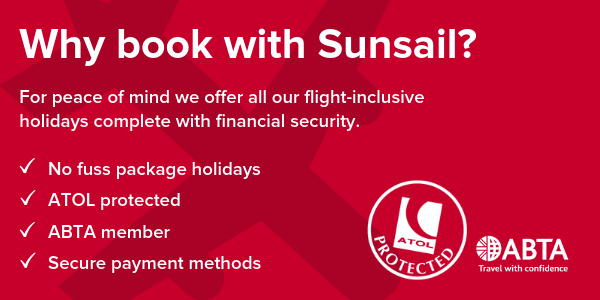 All Sunsail Sailing holidays are ATOL and ABTA protected, ensuring complete financial security when you're travelling abroad.